Most people are familiar with braces, which are metal brackets that are wired together and attached to your teeth in order to straighten them. Braces are tightened during visits to an orthodontist. Many folks do not like the feel or the appearance of metal in their mouth. For many people, there is a great option available: Invisalign. Invisalign® aligners are comfortable, virtually invisible plastic trays that are worn over your teeth to gradually shift your teeth into the correct position. Invisalign can straighten misaligned, crooked and crowded teeth, as well as correct overbites and gaps between teeth. Unlike braces, Invisalign® won't irritate your cheeks and gums. Once the aligner trays are created, you will need to wear them consistently to get straight teeth and a dazzling smile. Invisalign can be removed during meals and when you brush your teeth. You will need to brush your teeth after meals, and floss your teeth daily. A smooth, comfortable braces experience! Results that you will be proud to show off! 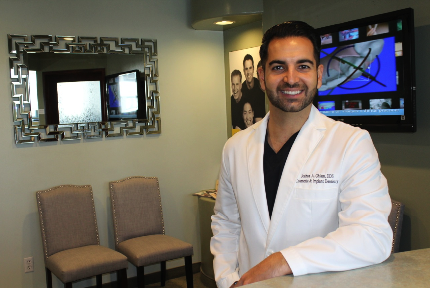 "I'm so glad I chose Dr. Joshua Ghiam for my Invsialign treatment! He genuinely cares about your progress the entire way. I couldn't be happier with my newly aligned teeth. Thank you so much!!" We offer a Satisfaction Guaranteed. His patients love him on Yelp! & Google. Patient-centered Approach that exceeds your expectations. We offer FREE Consultations to get you started. During an initial consultation, our dentist will examine your teeth to determine if your teeth would work well with Invisalign® braces. This is also a good time for you to ask questions. I just recently had my last set of aligners removed after Invisalign treatment and WOW, amazing results. Dr. Ghiam was with me every step of the way ensuring that I was comfortable the entire time. Great service!! I would say he's the best Invisalign orthodontist in Los Angeles currently. Give him a shot!! You will be impressed with his service, care, & attention to detail. If you are an Invisalign® candidate, X-rays, impressions and pictures of your teeth will be taken to create your custom-designed Invisalign® aligner trays. Our dentist will create a treatment plan that is designed to slowly move your teeth into place, and tell you how long it will take. While everyone is different, it usually takes about a year for adults. However, for teens the length of time normally matches about the same time that they would wear braces. You will probably need to wear your aligners about 20 to 22 hours per day. You will also need to come to the office for occasional checkups with our dentist. About every two weeks or so, you will switch to a new set of Invisalign aligners to slowly move your teeth into place until your treatment is complete. The success of Invisalign depends on how committed you are to wear the aligners. Straightening your teeth can improve your smile and your overall oral health. Misaligned teeth can lead to functional and hygiene problems. Invisalign® can help you achieve a dazzling smile makeover. The best part is most people will have no idea you’re even wearing Invisalign®. To find out if Invisalign® is right for you, please call (323) 651-0933 to make an appointment today.